NES has a pretty good night of racing tonight. With the weather supposedly threatening, there was a fairly small crowd on hand. Those who stayed home missed out, as the weather was actually great with no rain in sight. Racing started a bit late, at 6:20 PM, and the last feature was over somewhere around 10:00 PM or so. All divisions ran heats tonight! No time trials. I was glad to see that. There was a total of about 40 minutes down time. First was a 10 minute delay waiting for the Modified Consi, followed later by about a 30 minute break to water and smooth the track. Overall the track was pretty racy, with a decent amount of passing in each division. It's nice to see NES finally get a track surface that is consistent and manageable. Maybe it's just me, but it seemed like last week there was more action and music being played during the downtime and yellows. Maybe they were short handed tonight...not a big deal. Rocco Infante once again made his way to the front to take the win. 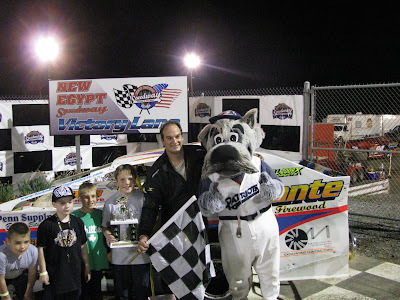 I believe Rocco has won all 3 Sportsman races he has entered this year, with two wins at NES, and one at Bridgeport. Rocco definitely has that car dialed in. Of note was rookie DJ Rupert, who started somewhere in the back, drove a clean race, and finished a solid 7th. What I didn't understand was why so many Sportsman rookies chose not run in the Consi, and therefore not be eligible to run in the feature. There were 14 cars scheduled to run the Consi, but only 9 came out, and with 9 to qualify, the consi was over in one lap. 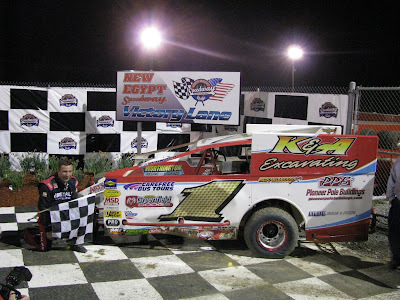 Several of the missing cars were rookies, including Brian Roemer, who again won the Rookie Feature tonight. **UPDATED** Monday 5/4: Thanks to an explanation on 3widesmessagevault.com by Ryan Simmons, the reason why some of the rookies did not come out for the Consi is because some of the rookies run a Crate motor, and are therefore not permitted to run with the Sportsman. Man, the mods must have run lap 1 like 5 times. There were several yellows in the beginning, including a big wreck when John Miloczar spun (or maybe was pushed) around in front of the whole field, taking out several cars, including the 00 of Gary Butler, and the 20 of Rick Laubach. Laubach came back out to run, but the car must have been damaged because he eventually got lapped and wasn't competitive. Billy Pauch worked his way to the front, eventually taking the lead from the 09 of Bobby Drayton while fighting through lapped traffic. 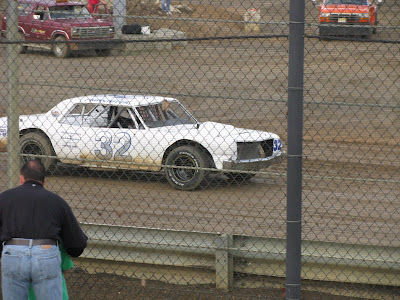 Bobby Drayton soon after spun in turn 4, ending his chances for a decent finish. Keith Hoffman was a no show tonight. That will be a tough hit in the points. 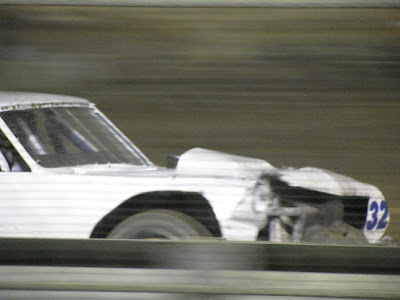 Jimmy Horton showed up tonight, but struggled with a poor running car, which looked to be very slow coming off the corners. I heard he may have been having carb problems. I missed the beginning of the feature, but something must have happened to the 32 car, which is a great looking 1965 Chevelle, because the right front was bent up pretty bad. 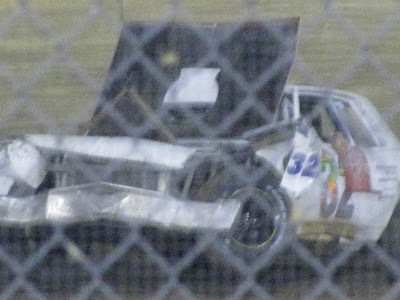 Later in the feature the 32 hit the cement barriers in turn 1 and really did some damage to the front of that car. I hope he gets if fixed and back soon. Of note was Vern McLaughlin, who spun while running 2nd, went to the back, and came back to finish 5th. Nice recovery. I really like watching this class because it is the only class left that's based on actual production cars. Each car has a distinctive body and look to it. No cookie cutters here. Oh, except the 82 fabricated "Camaro" of John Carpenter. 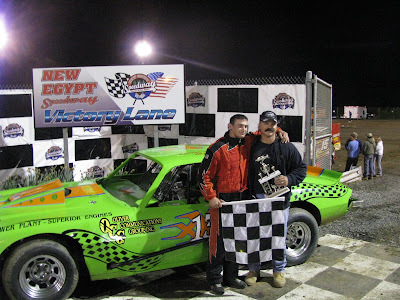 I hate to pick on him because the car looks great and runs strong, but why in the world would New Egypt allow them to run the fabricated body on this car? The rules as written state that the bodies must remain stock appearing-OEM body panels only. (NO FLAT SIDED BODIES). 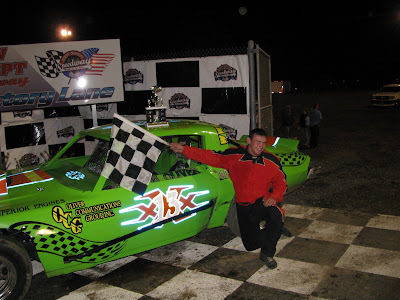 Why doesn't NES just keep the Super Stocks if they are going to let the Outlaw Stock class morph into a late model? The whole attraction of this class to me is that each car is unique and recognizable. It's just a matter of time before more cars start showing up with fabbed bodies and they all start looking the same.